The Mystery Project is finally open. Feel free to go take a look. Its a work in progress so please bear with me. New and exciting things will come soon. A bit of news! 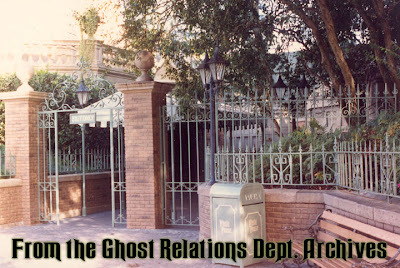 The Ghost Relations Dept will be shutting down in Mid-March. However, do not fear this is not bad news! The Mystery Project is almost complete and the blog will remain available for anyone who wants to read the archives. I will still be on hand to answer any and all questions about the Mansion but I will mainly be updating the Mystery Project as new material arises. Once I see how the Mystery Project takes off, other sections may open about other favorite Attractions in the Disney Parks worldwide. I will have a new contact address when the new mystery project opens so when it does, feel free to let me know what you think. I've spent a few months collecting material for the site and I think it will be wonderful. 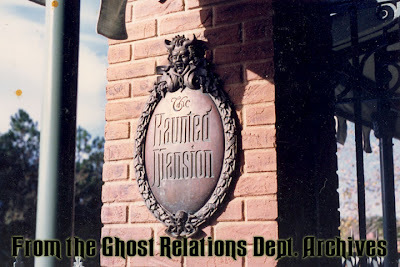 There was always one concept piece in the thousands for the Haunted Mansion that intrigued me. 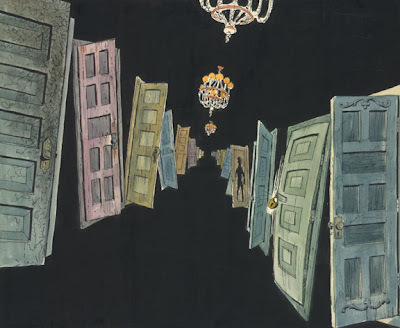 Marc Davis created an early rendition of the Corridor of Doors, not as we know it today, but as a large dark void filled with many doors in different stages of openness. Doorways to somewhere unknown. Of course, today its a regular hallway filled with doors that knock, clack and bend to the point of breaking. 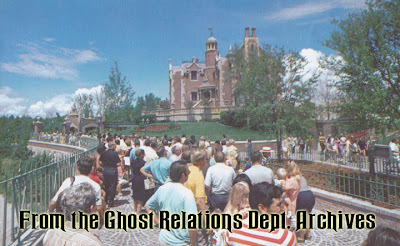 On a related note, when the creators of the Haunted Mansion movie were researching for their scenes, they apparently came across this concept as well. 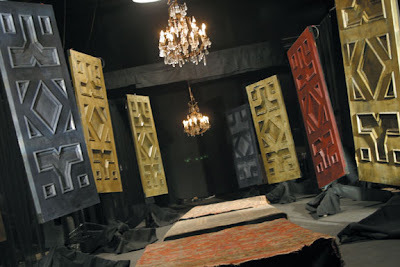 However, the scene was never shot, and the idea of the Corridor of Doors was saved until later in the movie when Sara Evers is running from Gracey. The door knockers in the hallway to her room all start clacking in unison as she runs. Which of course is interesting, as none of the doors even featured knockers. 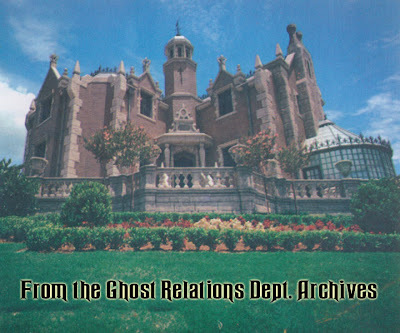 Back in the late 50's when the idea of a Haunted Mansion was being established, Walt expressed to Sam McKim and Ken Anderson that he wanted a pristine mansion facade in his park, not something terribly run down. 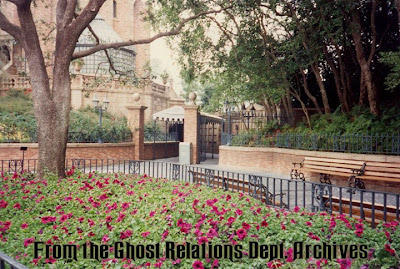 He explained that Disneyland would take care of the outside, and the ghostly inhabitants of the Mansion could do whatever they wanted inside. This statement, until the mid-90's held true not only for Disneyland, but also Walt Disney World. The Mansion's grounds used to house many tree and beautiful foliage, unlike today where there are broken and toppled fountains, overgrown foliage and a worn paint job on the facade. One Maid who has been at the Mansion for decades recounts that back then, it really did look like an estate, with trees everywhere, also without the current canopy it gave the full illusion of a residence. I would like to take a moment and give a big thanks to my friend Mike at WidenYourWorld for the material for this post. Thanks Mike! Hope to see you at the studio soon! Being in such close proximity every day with The Magic Kingdom in Walt Disney World, I have seen quite a number of their night time spectaculars in the sky. More recently, as in, last night, I was able to watch Fantasy in the Sky, the New Years Eve countdown fireworks. This was my first time viewing and hearing the show. There are references to nearly all the lands of the Magic Kingdom. The choice for Liberty Square? The Haunted Mansion of course. Giant Green and Purple fireworks blazed across the sky. Projections of ghosts flew across the castle, then up into the smoke clouds in the sky. Quite a performance. Here for you, I have posted an excerpt of the Grim Grinning Ghosts performance from the show. Enjoy! 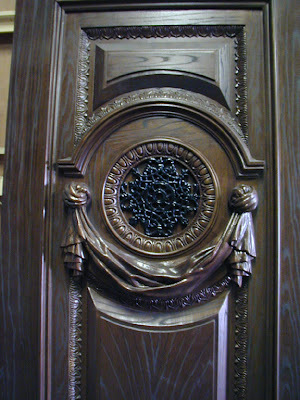 When the Disneyland Mansion was being finalized and they realized that the stretch rooms would be a nessecary part of the house, they installed a front door area into the foyer but it wasn't in the center of the house, but off to the side. This served two purposes: it allowed them not to have to use a small antechamber that ran along side of the stretch room from the center of the house, and it also allowed one front door to be placed in the center of the house for aestetic and design purposes. Instead, they installed the double doors which at one point would allow many more guests into the room in a shorter amount of time. 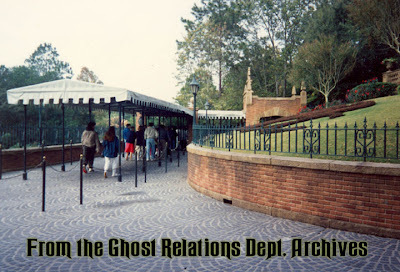 Over 20 years later at Phantom Manor, Imagineers went back to the original layout of the Disneyland Mansion and thought about why people couldn't enter the front door of the Mansion. Disneyland didn't exactly do it, Disney World and Tokyo Disney had you entering into a lower level side door, so what about Phantom Manor? Imagineers assumed what could be done about the antechamber and installed it anyway. And while the Manor show building matches up fairly close to Disneylands, the Facade layout is nearly identical in measurement and layout. Below is a photoshopped layout of the blueprints of the Disneyland Facade and also Phantom Manor. Entrance doors, exit areas and even the Cast Member break areas are in the same locations. 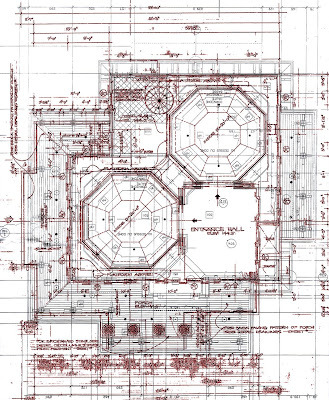 The Disneyland blueprint is outlined in red, Phantom Manor in black. At the Haunted Mansion, there are several Raven's throughout the Mansion. Some speculate that they are all different, others say that it is the same one that comes from room to room to oversee us. In the Graveyard over the band, there are two owls that are occasionally startled by the blast of a horn. But did you know that an owl makes another appearance so to speak? In the newly revised Stretch Room audio, within 20 seconds of the foyer door opening, an owl can be heard hooting, then fluttering away. Click here to hear a sample of the owl. Beautifiul, Breakable and Dishwasher Safe!